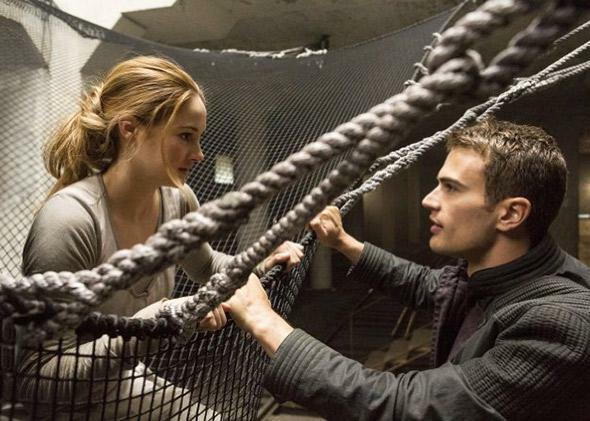 Divergent, starring Shailene Woodley, and the Hunger Games: Why teens love dystopias. Brutal, highly factionalized worlds governed by remote authoritarian entities? That’s basically high school. It’s not a mystery why so many young-adult best-sellers (and the lucrative movie franchises based on them) would take place in post-apocalyptic societies governed by remote authoritarian entities and rigidly divided into warring factions. The word dystopia comes from a Greek root that roughly translates as “bad place,” and what place could be worse than high school? Adolescence is not for the faint of heart. The to-do list for the decade between ages 10 and 20 includes separating from your parents, finding your place among your peers at school, beginning to make decisions about your own future, and—oh yes—figuring out how to relate to the world, and yourself, as a suddenly and mystifyingly sexual being. The strong link between YA and dystopia is no trendy post–Hunger Games phenomenon. Grim allegorical tales about dysfunctional futuristic societies have been staples in popular books for young people at least since Lois Lowry’s The Giver series in the early ’90s (a film adaptation of the first volume is set to come out this summer), if not as far back as William Golding’s Lord of the Flies, published in 1954. But since the massive success of Suzanne Collins’ trilogy about a bleak futuristic society that pits teenagers against one another in a televised gladiatorial fight to the death, young readers—along with the many not-so-young readers who are now consuming YA lit in mass quantities—can’t seem to get enough of projecting themselves into the future. And that’s despite the fact that the future, as presented both in the real-life media and in the entertainment we consume, looks to be fairly awful: a bare-knuckles struggle for survival in the ruins of a civilization laid waste by war and/or environmental disaster. YA dystopias externalize the turmoil that’s already taking place in adolescent minds, hearts, and bodies. The social, interpersonal, and biological phenomena that define teenage life—competition and jealousy, anxiety about exclusion and belonging, shifting alliances, first crushes, wet dreams—are codified and, in some way, dignified by their transmutation into fiction. The cutthroat race for high-school popularity becomes an annual televised fight to the death in Collins’ Hunger Games series, which is, in one reading, the story of a girl who’s voted the homecoming queen of the whole world, despite her protestations. In a scene repeated throughout the first book, the reluctant Katniss twirls gloomily in front of a mirror, modeling one in the endless succession of extravagant outfits her Capitol stylist has fashioned for her to wear to a Hunger Games event. For all her theatrical resistance to being dressed up like a doll, Katniss describes each outfit in loving detail—a touching demonstration of the ambivalence of teenage desire, which longs both to shine at the prom and to rise scornfully above it. Veronica Roth’s Divergent trilogy is one of the few YA dystopias to be created by an author relatively close in age to the group she’s writing for. (Roth was 22 when the first book came out in 2011.) In structure and theme (but not, unfortunately, in degree of enjoyability) the Divergent books are so similar to the Hunger Games series as to strain the bounds of writerly ethics. In post-apocalyptic Chicago, society has been divided into five factions, each with a strictly proscribed social and economic function (and a grammatically unparallel name). There’s Amity, Erudite, Dauntless, Candor, and the home faction of our heroine Beatrice (as well as of many a high-school girl I have known, or been): Abnegation. Upon reaching the age of 16, each child must choose whether to stay with his or her faction or defect to another, in a public ritual halfway between the Hunger Games’ “reaping ceremony” and a junior-high-school graduation: Parents attend, dressed up and beaming with pride, then have their lives ripped out from under them when their children effectively disappear forever from their lives. Rather than the realpolitik of high-school popularity, Divergent (which has now been adapted into a film by Neil Burger) sets its allegorical sights on the equally complex and crucial matter of high-school clique affiliation. Whether it’s the “greasers” vs. “socs” battle of S.E. Hinton’s seminal novel The Outsiders or the multitiered and violently enforced pecking order at a suburban Austin, Texas, high school in Richard Linklater’s 1993 film Dazed and Confused, stories set in the world of teens often revolve around moments of having to choose, publicly and painfully, who you are, to identify yourself with an established social category. This being high school, the selection of prefixed identities on offer is constrictively narrow and closely policed by powerful and malevolent forces. Any genuine self-discovery will reveal a flaw in the whole taxonomy, bringing down the system and enabling the realization that we’re all a little bit Dauntless, a little bit Amity, a little bit rock ’n’ roll—an internal drama that Divergent projects onto a grand historical scale. The film’s heroine, Beatrice Prior (played with an excess of acting firepower by the always-fascinating-to-watch Shailene Woodley), is a lifelong Abnegation who chooses at the last minute to become a Dauntless—basically, an Amish girl gone Goth. Beatrice, now known as “Tris,” is separated from her family and put into training camp as part of the brutal Dauntless initiation process (an ordeal that includes, at one point, the odd spectacle of seeing Woodley get whaled on in the boxing ring by Miles Teller, who played her high-school sweetheart in last year’s wonderful The Spectacular Now). Over the course of 143 long minutes, Tris evolves from a quivering pudding of self-deprecation into a superskilled warrior and athlete who becomes a leader of the resistance against the faction system. She especially excels at the drug-induced brain tests Dauntless candidates are required to pass (SATs, anyone?) in which her character, intelligence, and bravery are challenged in virtual scenarios enacting her deepest fears. Eventually, Tris’ embrace of her unclassifiable “Divergent” identity breaks down the resistance of her tough-as-nails commander, Four (Theo James), who reveals his own status as a fellow Divergent and declares his love, but not before letting Tris trace her fingers over his full-back tattoo: the symbols of all the factions, side by side. Divergent is not a good movie on the merits; it’s formulaic, repetitive, nonsensically plotted, at least half an hour too long, and let’s face it, the whole concept is pretty much the Hunger Games minus the originality and style. But as a glimpse into contemporary teenage culture, it’s not without its fascinations. As a former 14-year-old girl and the future mother of one, I can see the draw of a fantasy that recasts the rigid categories of teen social hierarchy as mechanisms of fascist social control, then stages a life-affirming rebellion against the pitiless powers that be (represented, in this case, by an icily Erudite Kate Winslet). If Divergent had come out the year I started high school, I might have—well, maybe not overthrown the whole system, but at least not spent that semester making a fool of myself in pep squad.